Water snakes from the eastern United States are being found in increasing numbers throughout California's waterways, and biologists at the University of California at Davis are growing concerned. The common water snake and the southern water snake thrive in suburban areas and human-disturbed habitats but are harmless to humans. However, they may pose a threat to native aquatic species, including some types of frogs, snakes and salamanders because they compete for the same food source or directly pray on the native species. The invasive water snakes have been found in some areas near Sacramento as well as near Long Beach in Southern California. “This instance of these non-native snakes is emblematic of a bigger problem in California where many of our native aquatic species are being replaced by non-native species,” says Jonathan Rose, a doctoral candidate at UC Davis. Rose has been working under Dr. Brian Todd, an Assistant Professor of Wildlife Biology, to analyze the snake’s potential to spread through California and the Western United States. 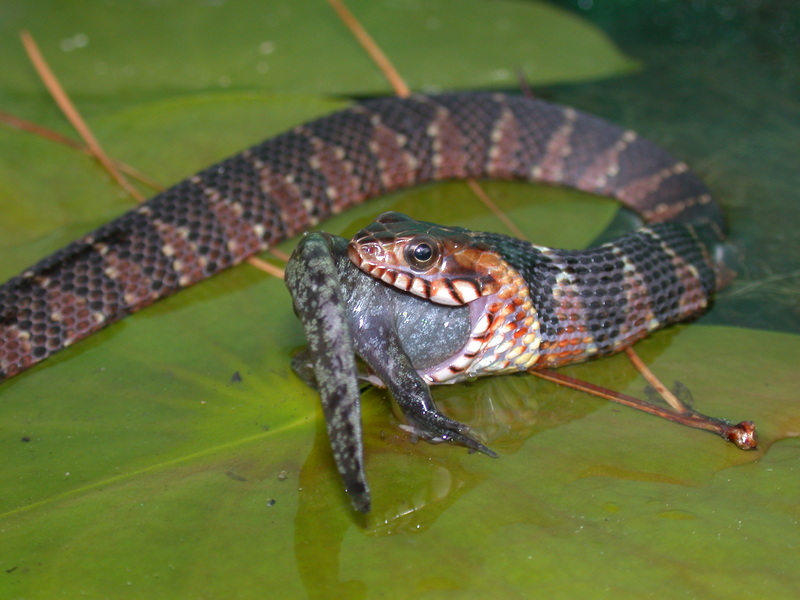 The study by Rose and Todd lists which areas will be affected if populations of the invasive water snakes continue to spread. 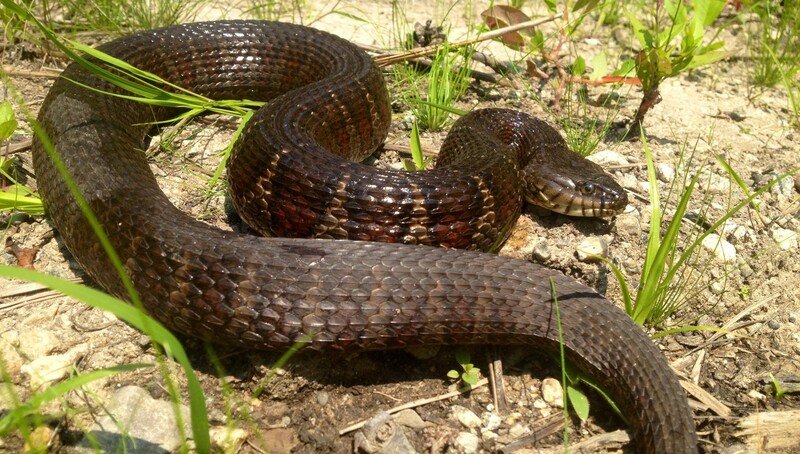 According to their projections, invasive snakes could spread throughout the western United States, overlapping with the habitats of native aquatic dwellers like the foothill yellow-legged frog, the giant garter snake, the California giant salamander and the California tiger salamander. “These non-native water snakes present yet another threat or stress to many already imperiled species," Rose says. Many of the native aquatic species are already at risk due to changes in their habitats and the introduction of other non-native species. Non-native water snakes have been present in California for quite a while now. As of 2008 it is unlawful to possess one of these water snakes as a pet, but Rose says they were likely introduced as a result of people releasing their pet snakes before this ban was in place. It is unclear exactly how many of these snakes are in California presently, but there are roughly 300 in the Sacramento area, according to Rose. While they currently pose no immediate threat to native species, non-native species often pass a threshold at which the population grows rapidly and starts spreading. According to Rose, we are at the early stage where snakes haven’t spread out of control as far as we know. The snakes aren’t having any negative effects on native species but that could change at any time. “These snakes are not picky eaters; they’ll feed on pretty much any fish or amphibian they can overpower,” he says. The common water snake is of particular concern, says Rose, because it is geographically widespread and able to survive in a variety of climates. Rose says that some snakes are capable of producing litters of 50 or more offspring. They also reach sexual maturity at two or three years of age, so their populations can grow rapidly and bounce back from negative influences. According to Rose, it is possible that the snakes have already spread throughout the state without our knowledge. If they are more established than we realize, they will eventually start to compete with aquatic species. But it may not be too late. Rose explained that the best case scenario is that fish and wildlife agencies put together a management plan to determine where these species are and act quickly to eradicate their populations. The common water snake and southern water snake are characterized by dark cross bands, which the native garter snake lacks. Sightings and pictures of introduced water snakes can be reported to californiawatersnakes@gmail.com.